There are a great number of Seattle Pioneer Square apartments that you can rent if you're interested in making this part of the city a more permanent fixture in your life. One of the good things about living in Pioneer Square is that it is relatively close to any downtown activity you might be interested in. Whether you like visiting art galleries, taking in the sights and smells of Pike Place market, or heading down a few blocks to see the Mariners or Seahawks play, living in an apartment in Pioneer Square is very convenient. While most people feel comfortable walking around Pioneer Square during the day, sometimes the number of homeless people that hang out during the evening can be a little unnerving. Also, there are a good number of bars in this area of the city and so there have been occasional incidents where some people have too much to drink and get a little out of control. If you are interested in living in Pioneer Square, you'll have to keep those things in mind, but it's really not much different than any other big city (or smaller city for that matter). 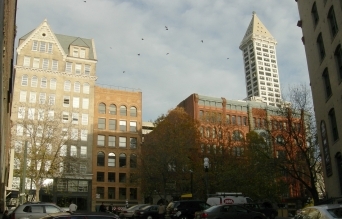 So what are your options if you want a Seattle Pioneer Square apartment? Well, there are a few things you can consider to find what works out best for you. Obviously the first choice that many people think of when looking for an apartment in Seattle is renting. Renting is usually pretty easy to do, as there are a lot of resources out there that you can use to find that perfect apartment. Most of the apartments you'll see for rent in Pioneer Square tend to be single bedroom loft-style apartments. These are probably ideal for one ore two people who don't need that much living space to get through their day. You'll want to look for lofts that have been updated in the past little while. Many of them have been refurbished to include new hardwood floors, new appliances, and more efficient energy fixtures. Another thing to look for when renting an apartment is to see what kind of amenities are offered with the rental. A few places offer things like access to fitness centers, concierge services, and use of guest rooms that can be used when you have people come visit from out of town. Renting Seattle Pioneer Square apartments will cost a bit, depending of course how nice you want your apartment to be and the kinds of amenities you're after. Prices can range anywhere between $1000 and $2000, and there are places that could even cost more. Another option that you might want to consider is house or apartment sitting for someone while they are away. These kinds of deals are harder to find, and usually rely on knowing the person for whom you would be house-sitting. However, many people that are going out of town for a few years or even a few months would rather leave their house or apartment to someone they sort of know, as opposed to leaving it completely empty. The best ways to find this setup is to keep your eyes and ears open and talk to people about what you'd like to do and eventually you might be able to find a house or apartment to watch. Whatever you decide to do, be sure to spend some time in Pioneer Square before renting an apartment so that you know what kind of place it is and how safe and comfortable you feel during the day and night, and you'll be able to find something that suits your needs. Back from Seattle Pioneer Square apartments.